Set goals for your future success! Set a clear direction for your practice. 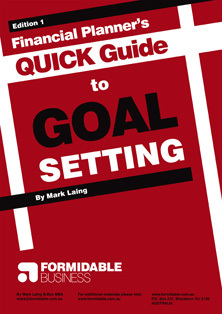 Use goal setting to be more effective in managing the business and achieving your long-term objectives. The Financial Planner’s QUICK Guide to Goal Setting is a FREE PDF download written specifically to assist advisers and practice management. Its practical action-oriented content is based on 2 decades of coaching financial planners to achieve their objectives. This comprehensive Guide includes the materials you need to set goals for the key areas of your practice. No obligation - just download the PDF document. Also available is the Financial Planner's Marketing Blueprint. Click here for your free PDF copy (34 pages).